A powerful, yet simple reporting tool that provides the information you need to receive full MIPS/MACRA incentives as well as helping you improve workflow. With information updated daily, you can quickly see where there may be gaps in participation by your providers so you can address them right away. No more waiting until the end of the quarter to hope that you have everyone on the same page, only to find out that hardly anyone is participating. Happe-Analytics presents your data in an easy to use visual format that lets you drill down to see exactly what data you have available. You no longer have to rely on and hope that your ACO is collecting and reporting the correct information. With Happe-Analytics, you can take control of your own data. Happe-Analytics offers more than just MIPS and MACRA reporting. With Happe-Analytics, you can take your practice to the next level of performance. Your EMR data is refreshed every day, so you will know each morning which reporting measures may need attention. No more worrying about having the correct data to submit. Quickly get a view of your entire patient population and where your practice stands with meeting the necessary measures for each program in which you are participating. Get an at-a-glance view of your payer mixes, E&M statistics and basic financial measures. Happe-Analytics not only can provide the reports for your MIPS/MACRA requirements, but also any other value-based programs you happen to participate in. Your staff can generate a printed patient task list so that you have ready access to the items that need to be addressed with each patient during their office visit. Track preventative health activities for each patient with a single click. With a single click you can easily view your at-risk patient list and see what action needs to be taken during their visit. Get an at-a-glance overview of common vitals for your patient. Visually see how your fellow providers compare with your core measure completion rate. Happe-Analytics is backed up by an experienced, domestic support staff, that is committed to making sure you get the answers you need. We will be there, as your partner, to guide you through every step of the process to ensure you can maximize your incentives. 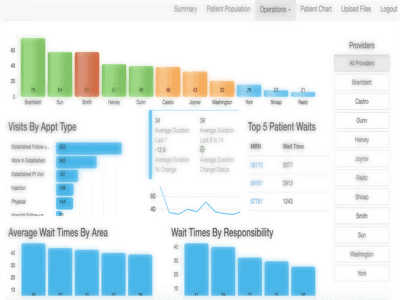 Quickly and easily analyze patient wait times or core measure percentages to see where there may be a need to increase staff training. Ready To Get Started On The Road To Maximum Incentive Payments?